3. The sewn veil without starched edges. I (with the assistance of mister Bertus himself) have been cutting and sanding wooden setting sticks and applying the starch to the frilled edge. 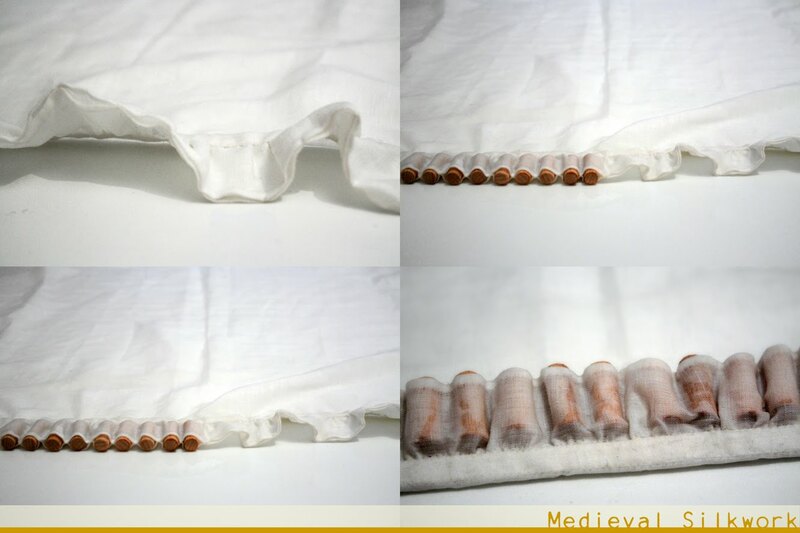 Starching a frilled veil is fairly easy. In the morning you can iron the veil and the frilled edge with the sticks still inside. Heat setting of frilled veils is not documented for medieval times, but it was used to starch/stiffen from the 16th century onwards. 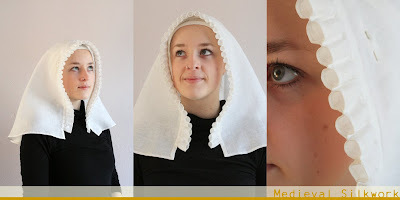 It does help to keep your veil in shape longer, which can be very welcome at events. I hope you enjoy your veil Maria! This is just marvellous! So beautiful Isis! Great :-) I really hope she enjoys her veil, I definitely would! Best wishes from northern Germany, Chris. chris, so nice to see you on my blog! i hadn't come to the conclusion yet that the chris from the comments was you! what a nice surprise! i'm really looking forward to seeing your weaving experiments! I love it and all the work that went into it especially the starching - are you sending her the rolls as well? What will she use it for? Yes, I will send the setting sticks together with the veil. They are cut to size especially for this veil. Maria will wear the veil to complement her wealthy late 14th century outfit at medieval living history events. That is so lovely. It may inspire me to make a frilled veil at some point. I could pin it to my Cap of St Brigit (which I have your site to thank for). It looks so sweet, beautiful!!! Such beautiful and precise work Isis!